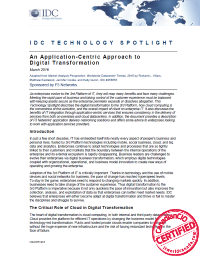 This IDC report looks at the imperative for enterprises to undergo a digital transformation to the third platform to stay in the game by responding quickly to market changes, take charge of the customer experience, speed innovation and better meet market needs. IT is embedded in nearly every facet of business and life today, fueled by third-platform technologies such as mobile, social business, cloud, and big data and analytics. But as enterprises adopt these technologies the boundary between internal operations and external ecosystem blur. Business leaders are challenged to evolve their enterprise through digital business transformation and change, the pace of which has reached “hyperspeed” levels.